Abdominal Cuts Green - Diet Pill Reviews: Does Abdominal Cuts Green Really Work? 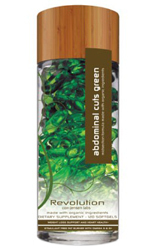 Abdominal Cut Green is another weight loss supplement in the rather lengthy Revolution line from Corr-Jensen Labs. This particular formula is a modification of the original Abdominal Cuts, with some less effective ingredients taken out and more potent ones added. The Abdominal Cuts Green formula is designed to cut fat around the stubborn areas of the body, like the abdomen, thighs and hips, without the use of any stimulants. Instead, this product uses a combination of naturally-occurring oils and botanical ingredients that provide health benefits in addition to enhanced weight loss. Abdominal Cuts Green keeps the conjugated linoleic acid (CLA) from the previous formula, along with sesamin and safflower oil. This formula adds fucoxanthin to the mix, which is a carotenoid from seaweed extract. Fucoxanthin is supposed to enhance fat loss by regulating a particular protein within the body. Initial research has shown great promise with this substance, but there hasn’t yet been sufficient evidence to state unequivocally that it has a positive effect on fat burning. This is particularly true since some of the clinical studies have been done on animals, making it difficult to ascertain how much of the fucoxanthin would be needed to also produce the desired effect in the human body. CLA has also shown some promise in initial clinical studies to accelerate the fat burning and weight loss process. This ingredient is rapidly finding its way into many other weight loss products for this reason. According to the company website, combining CLA with sesamin in this proprietary blend actually enhances the effects of the CLA as well. Some people do experience unpleasant side effects with some doses of CLA, including gastric upset and diarrhea. While some of the ingredients in this mix show great promise in weight loss, the proprietary blend in Abdominal Cuts Green does not let us know just how much of each ingredient is in each dosage. This omission creates a quandary for the consumer because it is difficult to know how effective a weight loss product can be without knowing the precise formulation.